Hotel Spazio Oasi is one of the latest addition of the Chia Laguna, located at its highest point and with panoramic views over the entire resort and the stunning Chia landscape. 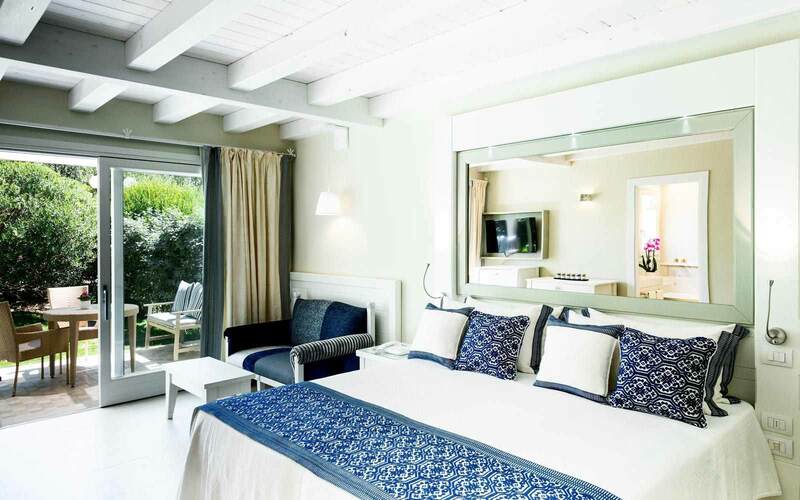 Decorated in shades of white and beige, Spazio Oasi offers a collection of 34 light and stylish rooms & suites: a contemporary twist on the traditional Sardinian style. 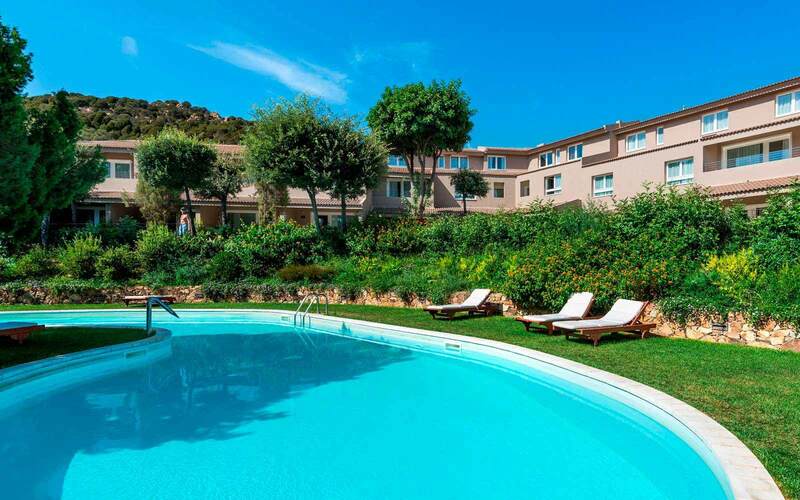 Set in Mediterranean gardens, the Spazio Oasi rooms have exclusive use of the Oasi pool with direct access from the rooms. 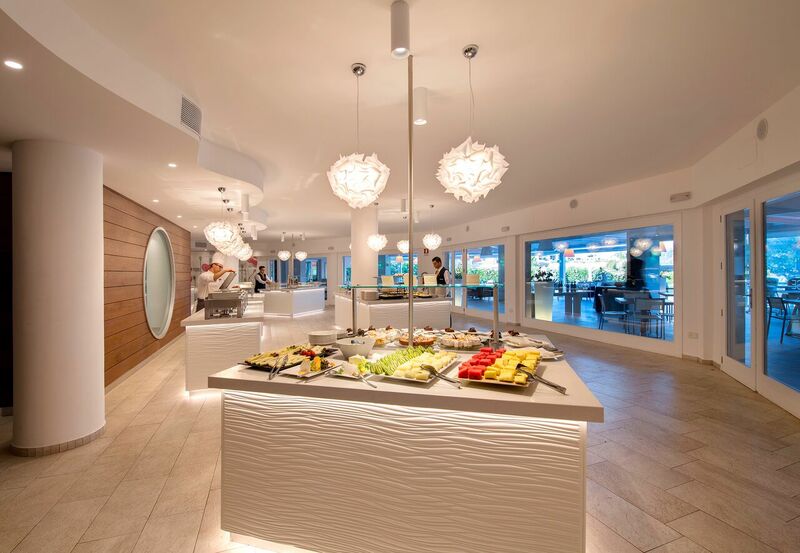 The Club House is the designated restaurant for a buffet breakfast and an à la carte dinner. Oasi Balcony Suite guests at Hotel Spazio Oasi have beach services included in first row. Please note: City tourist tax charges applicable by local authority. This is paid directly to the Chia Laguna upon check-out. (Not applicable to children under the age of 12 years). The Oasi Garden rooms are located on the ground floor of the complex. From the room, the large glass-doors lead into the garden of luxuriant Mediterranean vegetation, furnished with an outdoor sitting area. Ideal for couples. 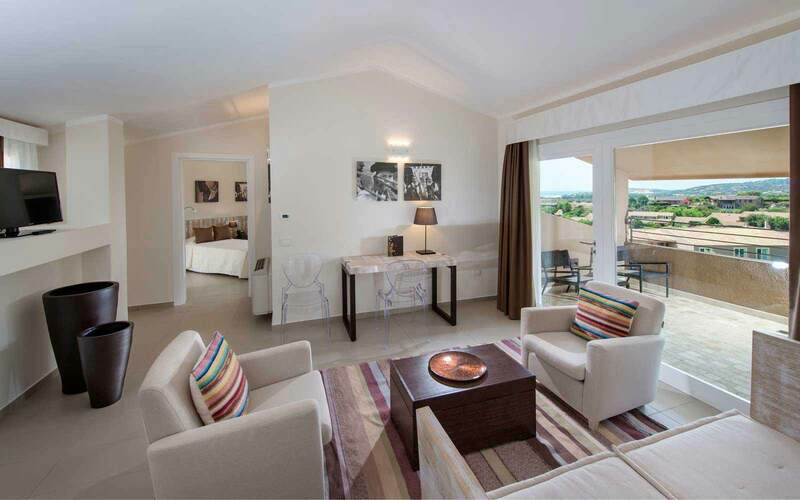 The Oasi Family rooms are on the upper levels of the Hotel Spazio Oasi. In an elegant and charming ambient, they come with two separate areas, ideal for families of three plus a baby in a cot. 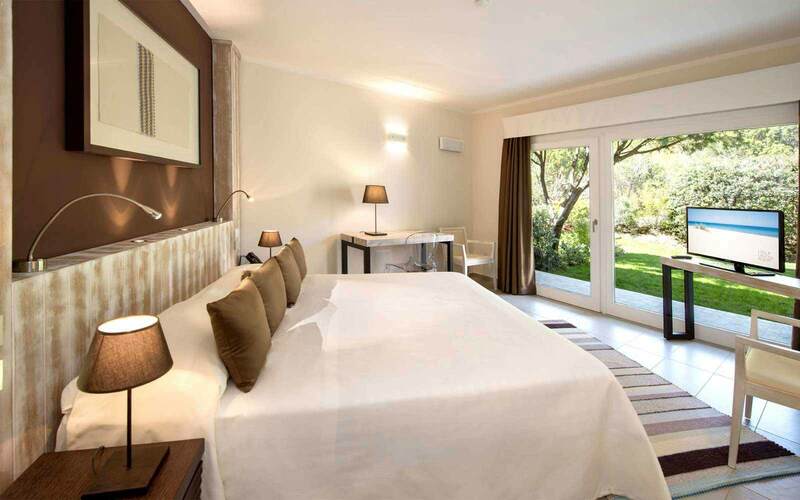 The Oasi Superior rooms are on the first floor with balcony and a small garden. 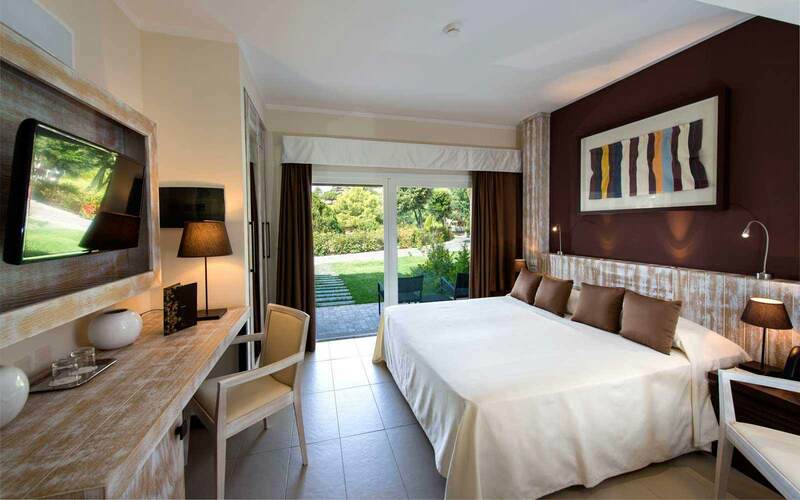 The understated elegance of the rooms enhance the beauty of the landscaping. 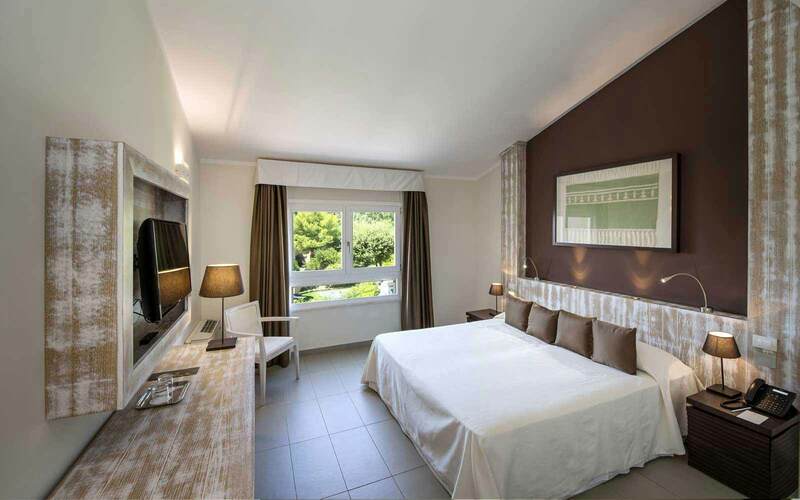 Due to the large size of the room, with separate areas, the Oasi Superior rooms are ideal for families of four. 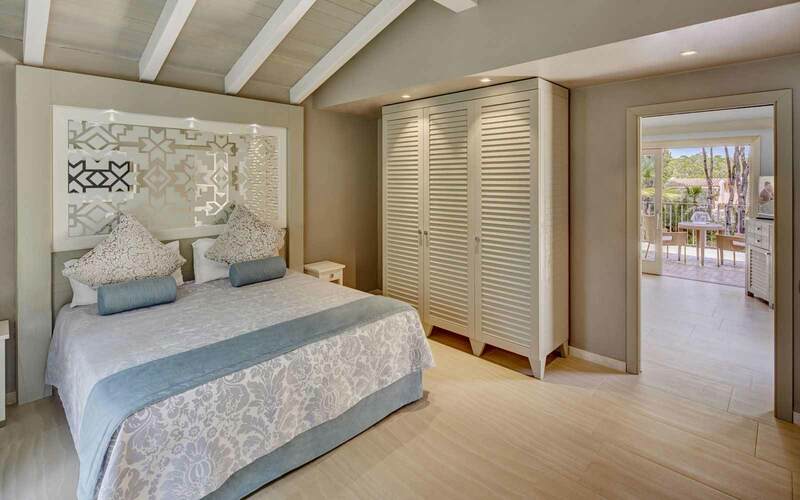 The Oasi Garden Deluxe rooms are on the ground floor, enjoy a private garden with an outdoors sitting area and offer the comfort of a room of great size, with the living area separate from the sleeping area. Ideal for families of three/four. The Oasi Balcony Deluxe rooms are large open space. The “plus” of the rooms is the panoramic view from the balconies that embraces the entire bay of Chia. The large size of the room makes the Oasi Balcony Deluxe ideal for families of 3/4. 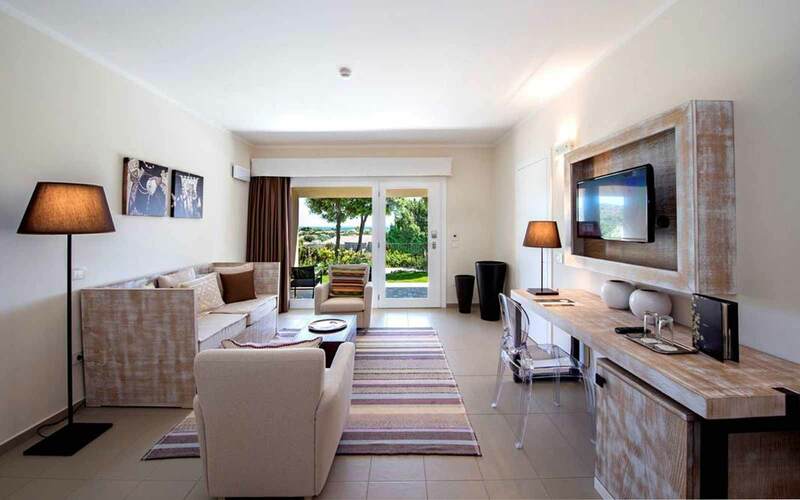 Located on the first and second level, the exclusive Oasi Balcony Suites offer a unique environment with two bedrooms, each of them with private bathroom, spacious living area and large terraces overlooking the sea. These rooms are ideal for families of 4/5. 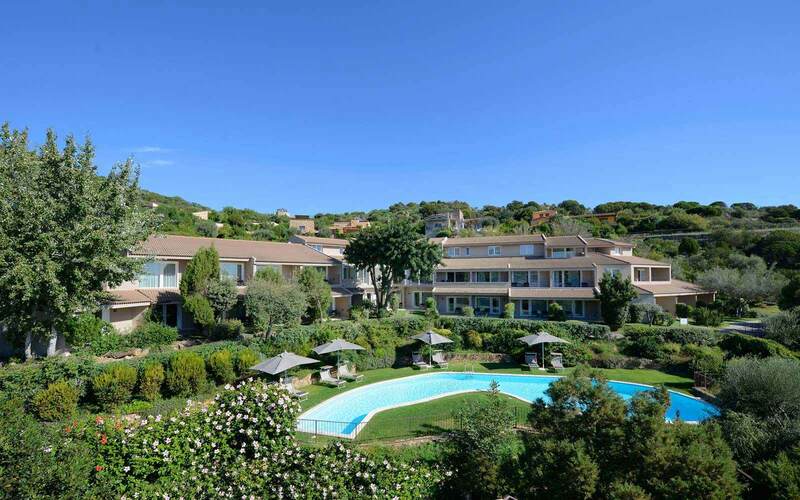 Oasi Balcony Suite guests benefit of beach services at Le Dune di Campana beach in first row. Interconnecting rooms available on request. May not be of the same room category. All rooms offer: air-conditioning, bathroom with bath and/or shower, hairdryer, direct-dial telephone, LCD TV with satellite channels, Wi-Fi, electronic safe, mini-bar and beach towels. Some rooms have bay views. Most have balcony or patio. 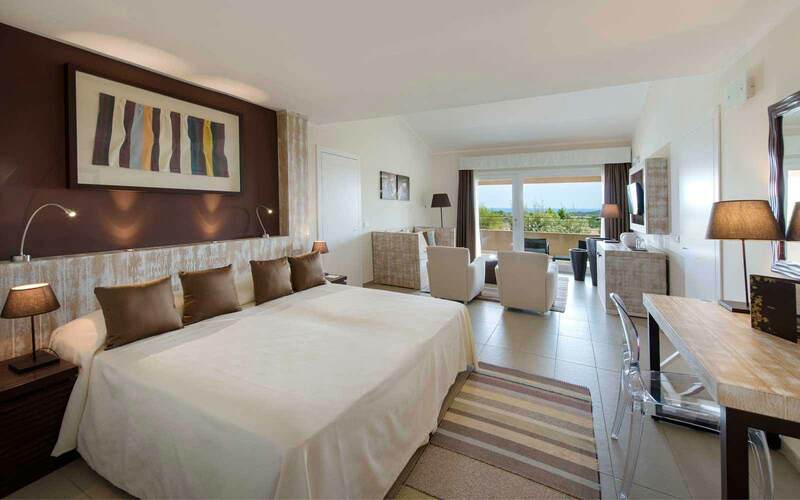 Returning guests receive a further 5% discount on the Half Board accommodation. - one complimentary massage at Chia Natural Spa for one person. The offer is valid for Weddings celebrated no later than one year prior to the date of arrival. Children between 04 - 35 Months receive Baby Kit and stroller free of charge (always subject to availability.